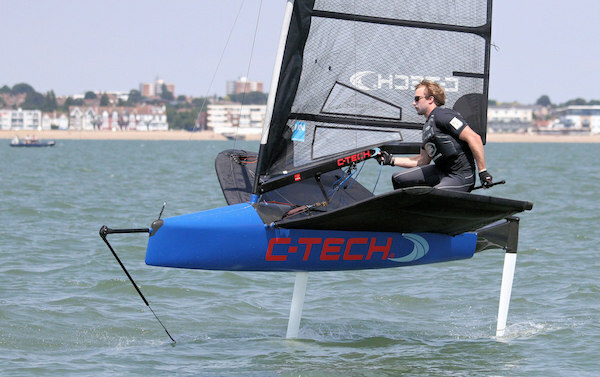 The International Moth UK National Championships has come to a close in Thorpe Bay, Essex with stunning sunshine and largely light winds the dominant forces in the championship. After a tough week of racing, it was expected that the series would go down to the wire, and that’s exactly what happened. The final race decided the title with four sailors still in with a shout of winning the event. The weather on Saturday 15 July was stunning, with early sunshine leading to a good sea breeze. The later high water allowed enough time for four races to be held, leading to the full series of twelve races being completed. A quick recap of the positions going into the final day; Jason Belben was leading by nine points, but Jim McMillan, Dave Kenefick and Simon Hiscocks were on the charge in the stronger winds. Would anyone be able to close the points gap on two-time champion Belben? Jim McMillan got down to business straight away in the first race of the day with a bullet, followed by fellow title contender Simon Hiscocks knocking in a win in the next race. Jason Belben’s lead was disappearing fast with a sixth followed by a DNC. One man who has not had his best event is last year’s runner up David Hivey. The light winds and an attraction to weed has led to some bad results and ‘loud’ moments on the race course. With the wind up for the final two races Hivey showed his true potential with a dominant performance and two bullets, moving him up to eighth overall. Praise for the event has been universal. Liz Adams from Allen Sailing presented the prizes to the winners in all the categories and then the competitors settled in to Happy Hour, sponsored by Wetsuit Outlet, and the vast majority are staying tonight for the club social with live band. Thorpe Bay Yacht Club really have pulled out all the stops for this event as the competitor feedback shows. Also a huge thank you to the sponsors of the event: title sponsors Allen Sailing and Noble Marine as well as WetsuitOutlet.co.uk, Maguire Boats and ShockSailing.com who have provided support for the daily pasta and beer for sailors coming off the water.